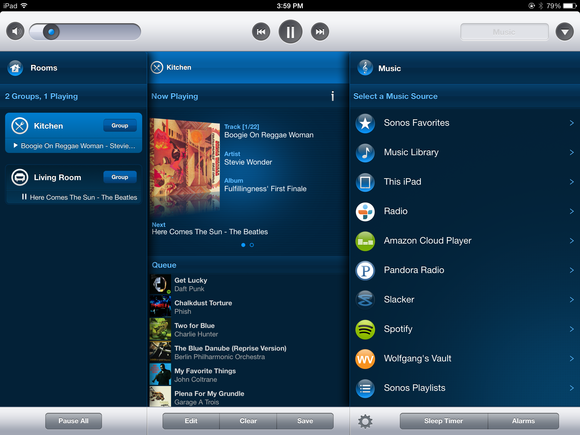 It took me a long, long time to become a Sonos user. Mostly because the financial pill was a bitter one to swallow, at around $1000 for a Sonos unit with an amplifier, another without an amp, and a bridge unit that made it easier to stream music through my home. Also, the concept of multiroom audio seemed a bit decadent in cramped San Francisco living conditions. Then two things happened: I found myself with more space, and the price of getting started in the Sonos universe dropped to magazine-editor levels. For $299, I picked up a Play:3 speaker with a free Bridge. (Sonos sometimes bundles the Bridge with other components). And then I kicked myself for waiting so damn long. The Play:1 fits nicely in smaller spaces, like next to the bed. The Bridge is the most common way of linking the proprietary Sonos mesh network to your own network. You hardwire it to your router, and it provides the system with Internet access and allows you to control the system with your smartphone, tablet, or Mac/Windows PC. The alternative is to string an ethernet cable between any other Sonos component and your router—but the router might be hidden in a closet or some other place you probably don’t care about playing music. With the Play:1, Sonos has added a smaller, less expensive speaker that lowers the barrier of entry even further, makes a multi-room system a bit easier on the wallet, and fits in more places thanks to its much smaller footprint. Oh, and it sounds pretty sweet too. I tested out the Play:1 in the kitchen/living room area, as well as on my bedroom nightstand, with a variety of different music. The capoed opening to “Here Comes the Sun” was clear and bright. The thick Moog synth on Stevie Wonder’s “Boogie on Reggae Woman” sounded delightfully nasty, but the vocals were still clear and the harmonica sufficiently jaunty. The guitar, bass, and drums of Daft Punk’s disco anthem “Get Lucky” were easy to tell apart, and Pharrell Williams’ vocals sailed to the top of the mix. Milt Jackson’s vibes on “No Moon at All” rang true and left room for McCoy Tyner to tickle the ivories. And the Berlin Philharmonic Orchestra’s rendition of “The Blue Danube” made me want to waltz around my living room. (I didn’t, but mostly because I don’t really know how to.) In short, the Play:1 did a great job with pretty much whatever I threw at it. And the volume easily got loud enough to fill a fairly large room without distortion. Next to the Play:3 (right), the new Play:1 looks so cute. Side-by-side with my Play:3, however, there are some obvious differences. (I left both at their default EQ settings with the sliders right in the middle.) As you’d expect, the three-driver Play:3, with its more stretched-out form, has a wider sound with more stereo separation. The Play:1 stacks its two drivers into a six-and-half-inch-tall ashcan shape that’s only four-and-a-half inches wide. Bass is more emphasized by default—common for smaller speakers—and the sound definitely feels like its coming from a smaller location. I closed my eyes and switched back and forth between the two speakers, and the Play:1 was easier to pinpoint in space, whereas the music coming from the Play:3 wafted from a more general area, with a broader feel. One cool Sonos feature is stereo pairing, which lets you link up two of the same type of speaker (two Play:1s, two Play:3s, and so on) as dedicated left and right channels. Sonos sent me two Play:1 speakers for testing, and I placed them about 18 inches apart and then linked them using the iOS app. The difference is quite striking, as that single point of sound on the Play:1 oozes out to the sides and builds an impressive soundstage. Of course, pairing requires, well, a pair of speakers, so you’re spending $400 for this type of setup. You can also combine two Play:1s (as the surround speakers) with the company’s Playbar soundbar and Sub subwoofer for a true surround-sound audio experience. Or just pair the Play:1 with a Sub if you’re looking for seriously phat bass. I heard both such configurations during a demo, and the Play:1s do better when they’re not expected to carry the whole audio load. Just press Play to start your queue. One seemingly small, but quite helpful, feature is that the Mute button on the other models has been replaced with a Play/Pause button on the Play:1. (Volume buttons are still there too.) Why is that cool? Because it means you don’t have to reach for your frickin’ smartphone or tablet to start or stop the music, possibly the most frustrating part of the Sonos experience. With the new button you can start playing whatever’s next in your queue. A quick double-tap even advances to the next track. Genius! The button worked as advertised in my testing, and I’m really happy to see its addition. And if you’re a Play:3 or Play:5 owner, say, feeling screwed that this new model can do something yours can’t, settle down, Beavis. A free software update turns your Mute button into the Play:1’s much more useful Play/Pause button (functionally, that is—you’ll need some paint and a pen if you want it to actually look the same). Controlling the Play:1 on the iPad. As with all Sonos hardware, you can listen to music from a great many sources: your own music library in most lossy and lossless (up to 16-bit and 44.1kHz) formats, the tunes on your smartphone or tablet, free Internet radio stations, Amazon Cloud Player, Pandora, Spotify, Rdio, Mog, Wolfgang’s Vault, Stitcher, Slacker, and more. The Play:1 is a great gateway drug to the Sonos ecosystem. It’s affordable, compact, sounds good, and includes all the capabilities and streaming options available to the other speakers. And for a user like me, it makes expanding the Sonos experience to other parts of the house more palatable. The Play:3 and Play:5 are better speakers, to be sure, and are better choices for your main listening area. But as a way to dip a toe in the water or enjoy music in more locations, the Play:1 is a great addition. The Play:1 is affordable, compact, sounds good, and includes all the capabilities and streaming options available with the other speakers. In short, it's a gateway drug to the Sonos ecosystem.